Turn any recording into a synthesizer! Use the built-in presets or any recording to create sounds never heard before. Make a synth from opera, from screeching cats, from the latest radio newscast. Create tones and timbres quite apart from the standard FM or subtractive synthesis fare. Any sound will lend its unique properties to MegaCurtis! Paste files from other apps, record through the built-in or an external mic, or transfer files through iTunes. Try it with speech, singing, synths, jackhammers, or birds. Mangle your recordings or create soft, gentle textures. Granular synthesis works by combining many tiny grains of sound from an existing recording. Wavetable synthesis works by sweeping through a series of single-cycle waveforms. MegaCurtis uses our hybrid of granular and wavetable synthesis, Gravetable™, combining the periodicity of wavetable synthesis with the chop and overlap of granular synthesis. 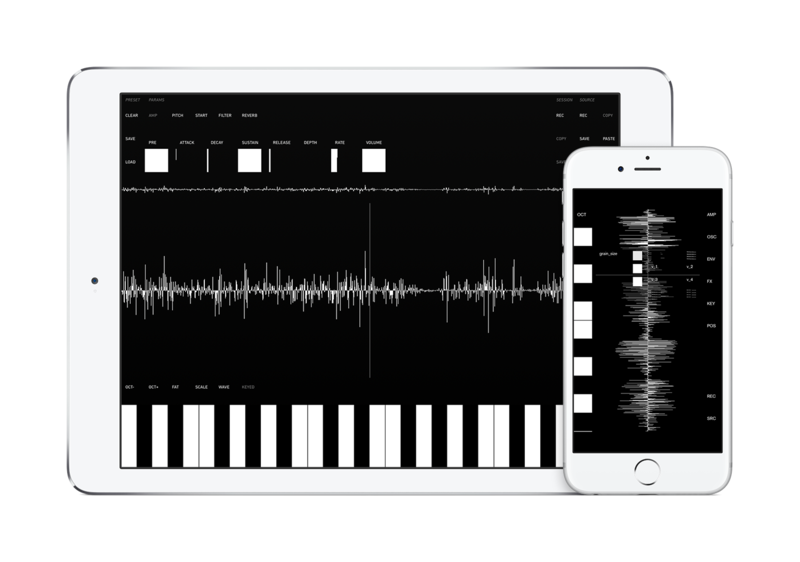 Control MegaCurtis from an external keyboard, your DAW, or even from other apps using the MIDI standard. Use your mod wheel to scroll through the source file. MegaCurtisBig for iPad now supports Audiobus and inter-app audio, so you can record its output with other apps or use it in conjunction with external effects. Musical scales are built right in, so you can dive in and jam without contorting your fingers or studying theory. What does MegaCurtis have that the old Curtis doesn't? Great question! Controversial it may have been, but the Mega edition added many features. In that case, what does MegaCurtisBig add to MegaCurtis? Yes, it does look rather similar, but we put a lot of work into this update. What's up with these weird square knobs? The Folded Faders™ let you dial in 4096 steps of fine control in the space of 128 retina pixels. Instead of emulating a physical fader, which would only give you a maximum of 128 steps of control in the space provided, we've folded up the fader to lend you much more finesse. Move it slowly, and you can fine tune things in tiny increments, or move it quickly to easily make larger adjustments. It takes some getting used to, but ultimately you get far more control. What on earth do the WAVE and KEYED buttons in version 1.1 do? The new WAVE button makes the main wave display playable by simply touching it. The new KEYED button will quantise the wave touch note pitch to the scale set on the keyboard. I heard version 1.2 is coming. What's that all about? A couple related things are showing up in this one. The first is the addition of multitouch to wave touch mode. You can now play the wave in multiple places at once! If this is your jam, rotate your iPad to portrait mode, and turn on KEYED mode. You now have a keyboard overlay for the entire wave, allowing you to play it even more easily than before.